Konishi Hirosada (ca 1810 - 1864) A Mirror of the Osaka Summer Festival (Natsu Matsuri Naniwa Kagami), 1850. Deluxe Chuban Triptych. A terrific triptych by the outstanding Osaka artist Hirosada. What makes this piece so interesting is the depiction of the machinery of the stage itself which in Osaka prints is unusual. 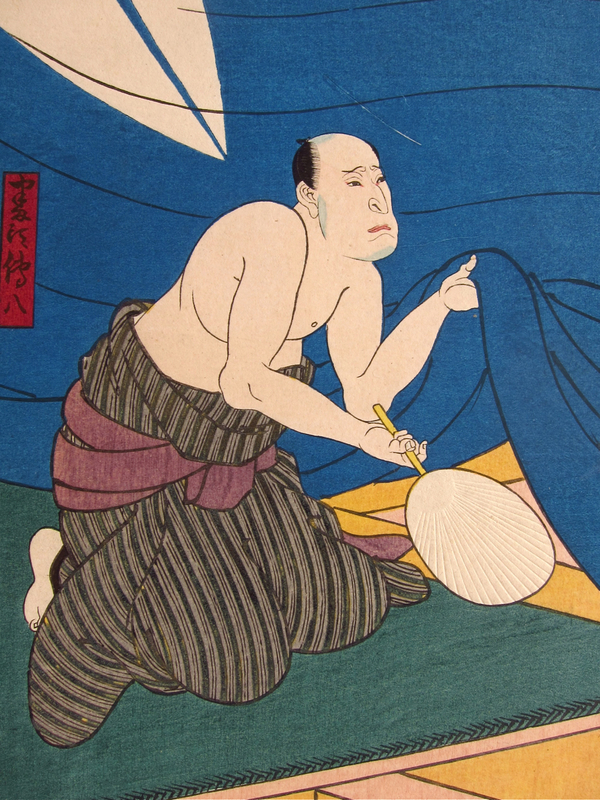 In this print, the subterfuge of depicting plays as if they were reality - the deliberate confusion of say the painted backdrop or screen - is abjured and Hirosda instead represents the stage, the exquisite blue curtain, the apron and the hanamichi (extension into the audience) as they were during the performance. This realism is startling and fairly unique. Not only does Hirosada show the structure of the stage, he also pictures some of the incidental timbers and braces for securing stage furniture. By doing so, he conveys much more of the actors and less of the roles. Compare this print with the following one by the same artist. They share a similar colour and tonality and some similarities in the way that the figures are disposed, but the presence of the actors is different. In the following print, Hirosada has eschewed the nuts and bolts of the stage and the roles become dominant as the scene takes on a more narrative atmosphere. The play is one of many that feature the villainous swindler Danshichi, a fishmonger who lived in the seventeenth century and was famous for murdering his father in law. He appears in many plays, and this being the kabuki theatre, his name, the plot and the other characters are all different. In Natsu Matsuri Naniwa Kagami, Danshichi enables two lovers to escape their feuding clans. Jitsukawa Ensaburo as the clerk Seishichi is pictured on the right in the act of eloping with Onaka, here played by Nakayama Nanshi. The figure about to disapear behind the stage curtain is the scheming clerk Dempachi played by Kataoka Ichizo II. The fine and bold design on the curtain is a bamboo grass emblem used by the Sasase Group of theatre enthusiasts in Osaka which subsidised the performance. The print is featured in the catalogue for the Museum of Fine Arts Houston exhibition of Hirosada in 1984 on page 48. A fine print, colour, condition and impression are all excellent.